Cholesterol is made soluble by bile acids, which help to enhance the digestion and absorption of dietary fats, making bile one of the major routes for the elimination of dietary cholesterol from the body. Ingested as part of the diet or derived from synthesis in the liver, cholesterol, together with bile acids, is conjugated to an amino acid and actively secreted into the gastrointestinal (GI) tract. Lipitrol includes nutrients that work in synergy to support healthy blood fats and maintain healthy cholesterol levels. The blend of ingredients in Lipitrol enhances the body’s natural cholesterol removal process by increasing the formation of bile and helping the liver to obtain more cholesterol from the serum. Sytrinol, one of Lipitrol’s key ingredients, is a potent blend of polymethoxylated flavones, citrus flavonoids, and tocotrienols from palm fruit extract. All of these ingredients help to support cholesterol metabolism, provide antioxidant benefits, and maintain a balanced inflammatory response. Other key ingredients include 200 mg of chromium as a patented chromiumniacin complex, 500 mg of gugul (2.5% gugulsterones), and 150 mg of artichoke leaf extract. Guar gum, a unique fiber, is also included to help bind bile in the GI tract, ensuring full cholesterol excretion. 2 capsules per day or as recommended by your health care professional. For best results, consult your health care professional about using Fiber Plus with Lipitrol. Cholesterol is made soluble by bile acids, which help to enhance the digestion and absorption of dietary fats, making bile one of the major routes for the elimination of dietary cholesterol from the body. Ingested as part of the diet or derived from synthesis in the liver, cholesterol, together with bile acids, is conjugated to an amino acid and actively secreted into the GI tract. 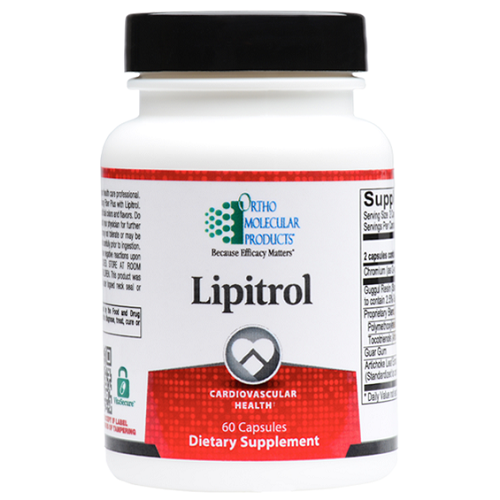 Lipitrol increases the production of bile, working with the body’s natural process of cholesterol elimination. Sytrinol® promotes healthy cholesterol metabolism by helping to control the degradation rate of the HMG-CoA reductase enzyme (required for cholesterol synthesis). Sytrinol®’s proprietary nutrient blend includes PMFs, unique citrus flavonoids (tangeretin, hesperidin and naringin), that inhibit the hepatic synthesis of cholesterol “building blocks,” apolipoprotein B and triglycerides. PMFs also help to maintain normal levels of inflammation, and offer extra antioxidant support to protect blood vessels and prevent cholesterol oxidation; both essential for cardiometabolic health. In addition, the tocotrienols in Sytrinol® limit the activity of HMG-CoA reductase by decreasing the half-life of this enzyme, helping to maintain balanced cholesterol levels without unwanted side effects. Sytrinol®’s effects have been shown in a variety of studies, including several human intervention trials. A 12-week, placebo-controlled clinical trial involving 120 men and women showed that compared to placebo, patients receiving Sytrinol® had significantly improved cardiovascular parameters. Those taking Sytrinol® had significantly improved markers of blood fats, and maintained healthy cholesterol levels. 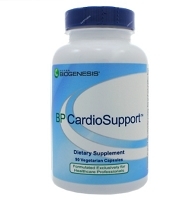 Other studies using PMFs including tangeretin, hesperetin, also found them to support healthy blood fat and cholesterol levels. [2-6] PMFs have also been shown in the literature to support healthy blood sugar metabolism. Gugul, a resin produced by the stem of the Commiphora mukul tree, has active components called gugulsterones, which support liver cholesterol metabolism and improve cholesterol uptake from bile. 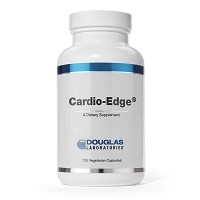 Several small studies have shown gugulipids to support the maintenance of normal cholesterol levels and support blood fat balance in humans. [8-10] Proposed mechanisms for gugul’s lipid-lowering effect includes increasing LDL receptors on liver cells allowing more cholesterol to be pulled from the blood stream. Artichoke Leaf Extract† Artichoke leaf extract (ALE) is known as a choloretic, and has specific compounds that promote the liver’s cholesterol reserves. Cynarin, a key constituent of ALE, also supports the production and release of bile, the main transport mechanism of dietary cholesterol from the body. ALE has been shown to reduce of HMG-CoA reductase enzyme, even when stimulated by insulin. 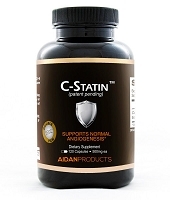 Several key studies have also shown cynarin to be useful in supporting healthy cholesterol levels. [13,14] A randomized, double-blind, placebo-controlled study investigating the effects of eight weeks of ALE supplementation or placebo found ALE to significantly modulate HMG-C0A reductase. Research has shown chromium to be particularly beneficial for optimal carbohydrate and lipid metabolism. Lipitrol uses a well-researched, niacin-bound chromium complex known as ChromeMate®. This unique form of chromium has been shown enhance glucose tolerance factor (GTF), the biologically active form of chromium in the body which works closely with insulin to facilitate the uptake of glucose into cells. In this way, it helps maintain normal sugar levels, especially among those with less than adequate intake and those with greater consumption of refined foods. In a study examining the benefits of ChromeMate®, healthy cholesterol levels were better maintained among men who took this unique GTFenhancing chromium. Soluble fibers, especially guar gum, have been shown to assist in maintaining normal cholesterol by sequestering the cholesterol-laden bile, ensuring full excretion out of the body. 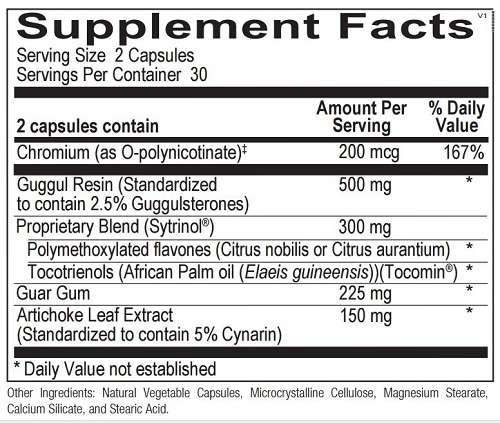 Directions 2 capsules per day or as recommended by your health care professional. For best results, consult your health care professional about using Fiber Plus with Lipitrol. 1. Roza JM, Xian-Liu Z, Guthrie N. Effect of citrus flavonoids and tocotrienols on serum cholesterol levels in hypercholesterolemic subjects. Altern Ther Health Med. Nov-Dec 2007;13(6):44-48. 2. Kurowska EM, Spence JD, Jordan J, et al. HDLcholesterol-raising effect of orange juice in subjects with hypercholesterolemia. Am J Clin Nutr. Nov 2000;72(5):1095- 1100. 3. Borradaile NM, Carroll KK, Kurowska EM. Regulation of HepG2 cell apolipoprotein B metabolism by the citrus flavanones hesperetin and naringenin. Lipids. Jun 1999;34(6):591-598. 4. Kurowska EM, Manthey JA. Hypolipidemic effects and absorption of citrus polymethoxylated flavones in hamsters with diet-induced hypercholesterolemia. J.Agric. Food Chem. 2004;52(10):2879-2886. 5. Kurowska EM, Manthey JA, Casaschi A, Theriault AG. Modulation of HepG2 cell net apolipoprotein B secretion by the citrus polymethoxyflavone, tangeretin. Lipids. Feb 2004;39(2):143-151. 6. Kurowska EM, Manthey JA. Regulation of lipoprotein metabolism in HepG2 cells by citrus flavonoids. Adv.Exp. Med.Biol. 2002;505:173-179. 7. Li RW, Theriault AG, Au K, Douglas TD, Casaschi A, Kurowska EM, Mukherjee R. Citrus polymethoxylated flavones improve lipid and glucose homeostasis and modulate adipocytokines in fructose-induced insulin resistant hamsters. Life Sci. 2006;79(4):365-73. 8. Nityanand S, Srivastava JS, Asthana OP. Clinical trials with gugulipid. A new hypolipidaemic agent. J Assoc Physicians India. May 1989;37(5):323-328. 9. Singh RB, Niaz MA, Ghosh S. Hypolipidemic and antioxidant effects of Commiphora mukul as an adjunct to dietary therapy in patients with hypercholesterolemia. 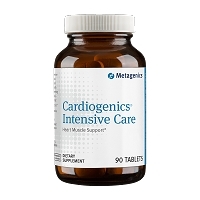 Cardiovasc Drugs Ther. Aug 1994;8(4):659-664. 10. Anderson RA. Chromium metabolism and its role in disease processes in man. Clin Physiol Biochem. 1986;4(1):31-41. 11. Singh V, Kaul S, Chander R, Kapoor NK. Stimulation of low density lipoprotein receptor activity in liver membrane of guggulsterone treated rats. Pharmacol Res. Jan-Feb 1990;22(1):37-44. 12. Gebhardt R. Inhibition of cholesterol biosynthesis in primary cultured rat hepatocytes by artichoke (Cynara scolymus L.) extracts. J Pharmacol Exp Ther. Sep 1998;286(3):1122-1128. 13. Montini M, Levoni P, Ongaro A, Pagani G. [Controlled application of cynarin in the treatment of hyperlipemic syndrome. Observations in 60 cases]. Arzneimittelforschung. Aug 1975;25(8):1311-1314. 14. Wegener T, Fintelmann V. [Pharmacological properties and therapeutic profile of artichoke (Cynara scolymus L.)]. Wien Med Wochenschr. 1999;149(8-10):241-247. 15. Rondanelli M, Giacosa A, Opizzi A, et al. Beneficial effects of artichoke leaf extract supplementation on increasing HDL-cholesterol in subjects with primary mild hypercholesterolaemia: a double-blind, randomized, placebo-controlled trial. Int J Food Sci Nutr. February 2013;64(1):7-15. 16. Anderson RA. Chromium metabolism and its role in disease processes in man. Clin Physiol Biochem. 1986;4(1):31-41. 17. Roeback JR, Jr., Hla KM, Chambless LE, Fletcher RH. Effects of chromium supplementation on serum high-density lipoprotein cholesterol levels in men taking beta-blockers. A randomized, controlled trial. Ann Intern Med. Dec 15 1991;115(12):917-924. 18. Superko HR, Haskell WL, Sawrey-Kubicek L, Farquhar JW. Effects of solid and liquid guar gum on plasma cholesterol and triglyceride concentrations in moderate hypercholesterolemia. Am J Cardiol. Jul 1 1988;62(1):51-55.